I was given your card by your assistant at the World of Pets Expo this past weekend. I came by your booth to show off my Nupro dog, Morgan. I was very proud that I could show people up close and personal what a pet on Nupro truly looks like. 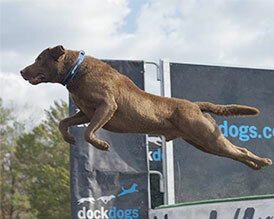 Morgan is a 3-1/2 yr. old Chesapeake Bay Retriever who competes in Dock Dogs. We're starting our third season and as you can see from his picture, he's quite successful. 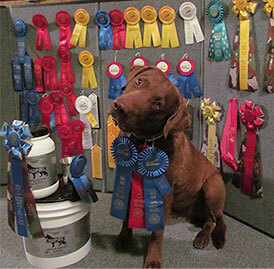 He has a Regional and National Big Air Senior Title and was voted 2011 Top Senior Dog in our Dock Dog club. The 2011 season was an exceptional year. Morgan continually put up new personal bests, was usually the Senior dog to beat in his tournaments, made and placed finals in 4 of his 6 events, and is one of the top seniors in the country. At the end of the season he jumped out of the Seniors and into the Masters. His high 19'0 jumps now became 20'0+. At the Pet Expo he jumped himself out of the Senior finals by jumping into the Master division at 20'9! He is now one jump away from his Masters title! This past season I started adding Nupro with Joint Support to his raw food. Coincidence? I think not. I feel the addition of Nupro to his diet daily has given Morgan the extra edge he needed to have the success he is experiencing. I wanted to make sure his joints are protected from the stress of jumping all the time and wanted to make sure he had the proper vitamins and minerals needed for his active lifestyle. Nupro is the best! Thank you so much for developing a great product and helping me to keep my dog healthy! Just a note to say thanks and let you know we so appreciate all your support and generosity over the years! We love the Nupro because it has helped so many of our dogs get on the road to health! 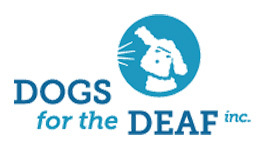 Our policy at Dogs for the Deaf is that once a dog is adopted by us they never return to a shelter and we always take them back and find them a new home no matter how long it takes. Thank you for your help in keeping them healthy during this process. I am sending you some pictures of one of our recent placements. He is Hearing Dog named Finley whom we just placed in New Jersey. I know you will enjoy his story! Kimberly W., New Jersey, was born with severe hearing loss. Then she lost more hearing due to a virus. With a husband, three active children, and a part time job as a teacher, Kimberly knew she needed help with sound awareness, and she applied for a Hearing Dog. We placed her first dog Rico with her in 1997, and he helped her until 2010. 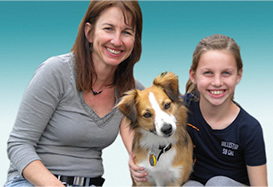 After Rico’s passing, Kimberly wanted another Hearing Dog to help her with her family and her work. She quickly realized how much independence Rico had provided for her. Her whole family also really missed having Rico around. 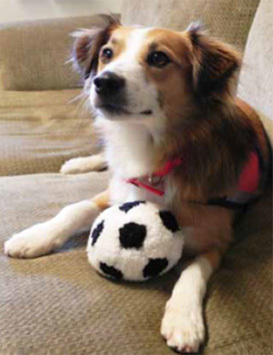 The right dog for this busy family was Finley, a two year old, male, tri-colored Sheltie mix. Finley had been at the Tehama County Animal Shelter as a stray for a month. For some reason everyone passed him by until one of our trainers saw him and evaluated him. He was sweet, friendly, and loved life. He went through the normal medical evaluations and was soon ready for training. He learned how to respond to the various household sounds – oven timer, door knock/bell, name call, telephone, and smoke alarm. He also learned obedience skills, and six months later he was ready to meet his new family in his forever home. When the trainer arrived at Kimberly’s home, the children were concerned with how bonded Finley was to the trainer. After all, he had been with her for six months, but by the second day of the placement, Finley was following Kimberly around more and more and being attentive to her needs. By the third day, Finley absolutely knew this was where he belonged - this was home. As Finley alerted Kimberly to the sounds perfectly and with great confidence, the whole family realized this was going to be another great partnership. They all were amazed at how smart Finley was and how much love he had to give. Rico will always be missed, but Finley has quickly become an important part of this family, providing Kimberly with sound awareness and the whole family with peace of mind.